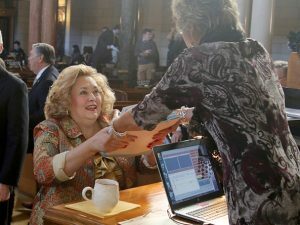 Sen. Carol Blood delivers a bill to be introduced Jan. 3. LB780, sponsored by Lincoln Sen. Patty Pansing Brooks, which would prohibit the manufacture, import, transfer and possession of multiburst trigger activators and firearm silencers. A complete list of introduced bills is available at NebraskaLegislature.gov.